Intrigued by the premise: radio talking head deals with an obsessive listener that is murdering callers that he has formed connections with during his show. Charlie D possesses a fight for the underdog sense of honor, a large port-wine birthmark over his face, abandonment and intimacy issues and a now very pregnant producer who serves as friend, mother, counselor and protector. The first in a collection of “mini mysteries” the audio recordings are about one and one-half hours in length, in written form they are about 130 pages. A quick mystery bite that felt very character driven for me, with Charlie’s approach to his listeners as sympathetic ear, calming influence and even a late-night ear for those moments when life is too rough, callers who seemingly had found a reason to move forward with his help are turning up dead, with notices being sent to the radio station stating that they weren’t worth the time Charlie had taken to speak with them. Charlie is interesting, and his relationship with Nova (his producer) is much like a brother-sister or mother-son – she isn’t afraid to verbally smack him into sensible thoughts, even as she worries for him and protects him from the odder realities of his public persona. This story was all about obsession and transference and the tension builds neatly to the surprising conclusion. Narration is provided by Daniel Maté, and I was fascinated by the approach. Charlie does make note of the fact that “all radio personalities” adopt a “radio voice” and his is calming, soothing and just perfect. Maté uses this element to give a clear delineation of Charlie’s normal narrative voice and his “on air” voice with near perfect emphasis and pitch. With other characters, his tone changes are minimal and work perfectly. This is really a story from Charlie’s POV, and using his voice, with appropriate switches from public to private voice is perfectly suited to the story. For readers who aren’t certain about mysteries, or those who want a ‘cleaner’ story that is suitable for introduction to both audiobook renditions and mysteries, these are a simple bite that could be appropriate for adults or teens. Charlie D is the host of a successful late-night radio call-in show. His listeners have a particularly intimate relationship with him and often reveal much about themselves, confident that he will honor their trust and that he can save them. In their minds, he is perfect: one of life's winners. But Charlie feels he's something of a fake. His easy confidence on-air belies the reality for a man born with a wine-colored birthmark that covers half his face. 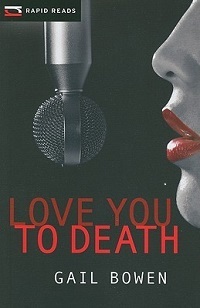 Love You to Death covers one hour on "The World According to Charlie D"--an hour during which he must both discover the long-time listener who is killing the people who trust him and attempt to come to terms with the man behind the birthmark. Gail Dianne Bowen (née Bartholomew) is a Canadian playwright and writer of mystery novels. Born in Toronto, Ontario, Bowen was educated at the University of Toronto, the University of Waterloo and the University of Saskatchewan. She subsequently taught English in Saskatchewan, and is currently a professor of English at First Nations University of Canada. Bowen's mystery novels feature Joanne Kilbourn, a widowed mother, political analyst and university professor who finds herself occasionally involved in criminal investigations in various parts of Saskatchewan. Many have been adapted as Canadian television movies by Shaftesbury Films.